This provides the files for including the Guild Wars 2 tooltip BBCode. As a fan of Curse.com I decided that I should utilize the new GW2DB tooltip information. This provides the files for displaying the tooltip properly within posts. This is not for fun but for those who intend to run Guild Wars 2 sites or those who already do. Will have a quick release to add more features. 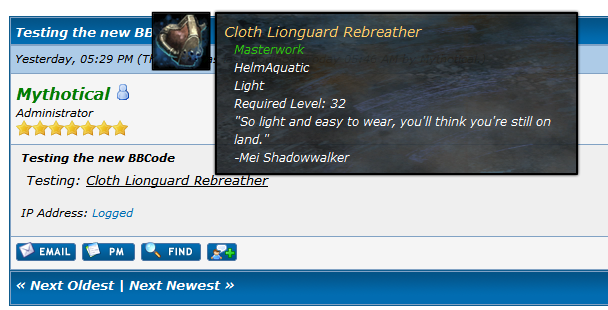 Short Description: This adds the tooltip for linking of items from Curse.com's GW2DB database. As I expand on this more I will include more MyCode's. Looking to add Recipes and Achievements next.